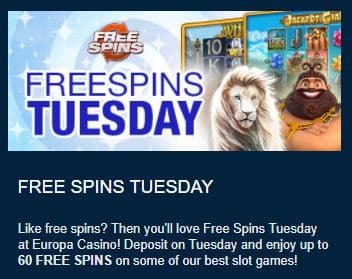 Every Tuesday, you have the chance to upgrade your experience at Europa Casino UK. Deposit 20 pounds or more and you can receive up to 60 Spins. You will start with 20 bonus rounds, but the good news is that you can claim this bonus three times. Use the extra rounds to have fun on Halloween Fortune, Halloween Fortune 2, White King, Jackpot Giant, and Frankie Dettori's Magic Seven. Meet the 50x wagering requirements before making any withdrawals. Get your hands on this awesome bonus now!